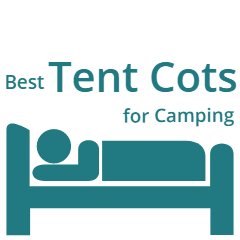 In this text I give a list of 7 Best Camping Cots With Air Mattress that are available on the market in 2019, all completely collapsible and portable, suitable for outdoor and home use. Two cots are with the dimensions which put them in the group of cots for one person. 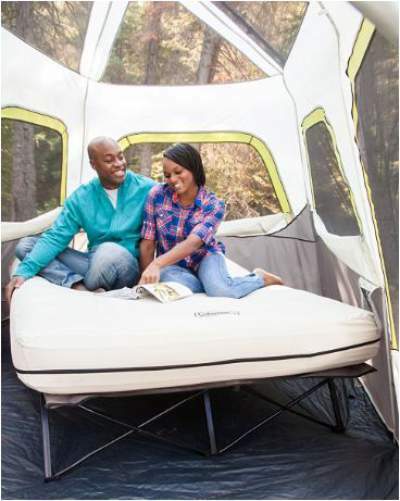 Three of the cots are double-wide type, so these are great tools for couples. Obviously, when used outdoors, they require a large tent. All cots are completely collapsible. This term implies that when packed, they reduce to a very small size with only one relatively large dimension, so that they easily fit in any car trunk. One of the cots is in the group of collapsible tent-cots, which means that it comes with a tent that sits on the cot. So this is a complete sleeping system. All these tools can be used at home as well as spare beds for sleepovers and sudden guests. All come with thick inflatable pads. Several of them also include either a cover or a sleeve for the mattress. This makes them quite comfortable and you will not be touching the plastic at any point. Some models come with an integrated pump which needs electric power, so this limits a bit their use as camping tools. All are described in detail in my separate reviews, so please follow the links to see more. This is a complete sleeping system which includes 9 elements in total: the cot, tent attached to it, inflatable pad, sleeping bag, inflatable pillow, foot pump, pad cover, pillowcase, carrying bag. From the numbers in the table above, you realize that this is a really wide cot, but it is not for very tall people. Bear this in mind and if you are very tall, you might want to check one of these. As you see from the picture, here you have a very thick and wide comfortable mattress. It comes with one side-table with cup holder. A pump which works on batteries is also included, and a sewn-in cover with a zipper keeps the mattress in place. This is a true giant, a sleeping system for couples, and the most versatile of the three double cots in the list. Its packed size is quite reasonable, 48 x 18 inches (122 x 46 cm), and the pump works on batteries. 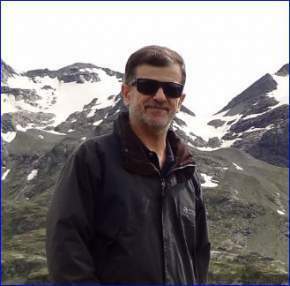 (19.4 kg). There are several elements in this set, so please follow the links to see more. 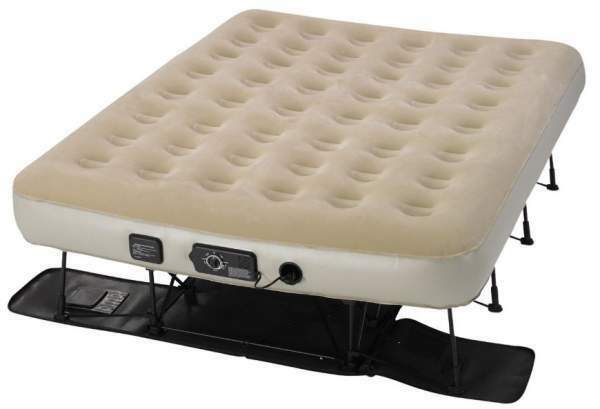 This huge bed with the air mattress comes with an integrated electric pump. This is one of the several differences as compared with the model above which is from the same brand. 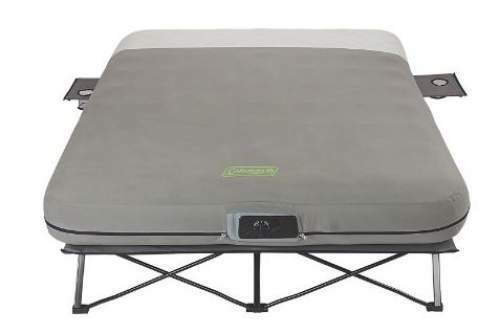 Coleman Queen Frame Airbed Cot. You will notice it comes with two side tables with cup holders. The mattress sleeve is fixed to the cot, so it is not removable. Its packed size is really great for all what it includes, 39.6 x 10.5 x 10 inches (101 x 27 x 25 cm). (20.6 kg). Please follow the link for more. As you realize from its name, this Insta-Bed is a queen size and you have the bed that measures 78 x 60 inches (198 x 152 cm) and the air mattress is 9.5 inches (24 cm) thick. The bed weighs 48.9 lb (22.2 kg). 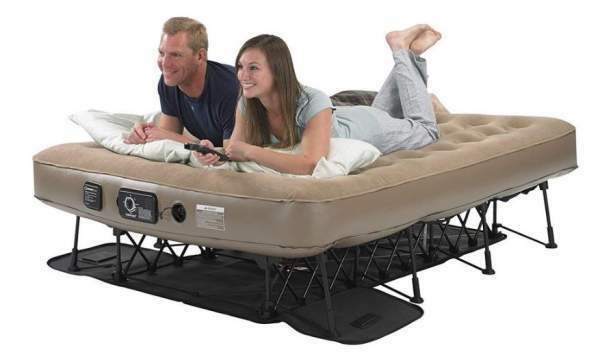 This is a bed equipped with two electric pumps. So the primary pump inflates or deflates the mattress and this is done in 2 minutes. The other is what they call NeverFlat, a quiet pump with sensors which activates automatically if the pressure is reduced. The frame is a very strong steel and you have 28 legs. This all packs to a nicely designed carry bag which is 37 x 18 x 17 inches (94 x 46 x 43 cm). They have Queen and Twin versions. The Queen is is the biggest but also the heaviest cot in the list. It offers a lot of space for two people, and it comes with a very thick air mattress. It inflates and deflates automatically due to the integrated electric pump. The weight is the same as in the Insta-Bed above, 48.9 lb (22.2 kg). This Queen cot requires a bit more space than the numbers 3 and 4 above. Its packed size is 26 x 21 x 16 inches (66 x 53 x 41 cm). So it is surprisingly short when packed, but it is a bit bulky, like a big suitcase. But it has two wheels so moving it around should not be an issue. The Twin version is smaller but will the same basic features, and with the different price of course. This Serta EZ Bed looks similar to some of the beds above, but there are differences regarding the pumps and deployment. So the bed comes with a primary and a secondary electric pump. The former deploys the bed automatically and this makes it different from the Insta-Bed above. The same pump also deflates the bed. The secondary pump keeps the pressure at the desired level, and this is the same as in the Insta-Bed. This is a large bed and the size is 78 x 60 inches (198 x 152 cm). It weighs 50 lb (22.7) and this is why it is in this position in the list. But it comes with a nice carry bag equipped with a handle and wheels. 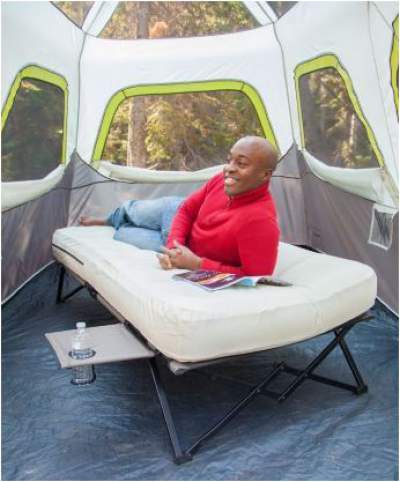 To conclude this text about Best Camping Cots With Air Mattress, as you realize you have two main groups, for solo use and for couples, but they are quite different in many ways. 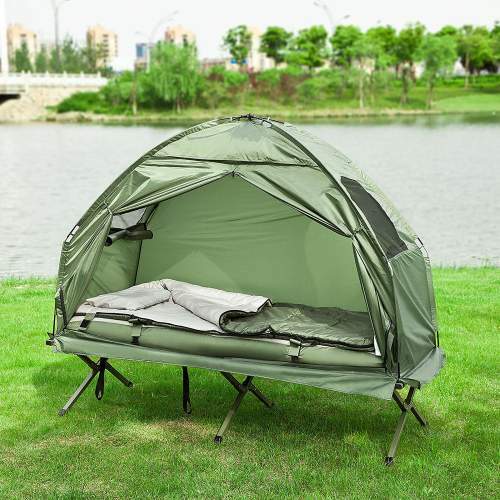 The only model which includes a tent is the Haotian tent-cot, and this is a complete system with many elements. If you prefer cots with foam mattresses, no worry, there is a long list of such tools in the site, so please check here. Thank you for reading, please have a look in the links below, those are the cots listed above. If you have any question or comment, please use the comment box below. Have a nice day.